I ran into Teresa at last weeks Mash Tun festival at the Bridgeport Art Center — an event that brought together craft beer lovers from near and far on Chicago’s south side in celebration of the city’s new craft beer journal. And just as we were in the middle of discussing some of our favorites from the day, including Firestone Walker’s Wookey Jack Black Rye IPA, Teresa caught wind that the boys from Pipeworks had arrived. And just like that, she was gone again. What’s your favorite beer style and beer? I prefer Pilsner-style beers but also gravitate towards Belgian style and stout. I usually enjoy Lagunitas Pils or Trumer Pils, but my favorite Pilsner is made by a regional brewery in the Black Forest called Tannenzäpfle. Beer doesn’t last long in my house. We just finished off two growlers from Rev Brew: Eugene Porter and Black Power stout. Leffe Brune is the first beer that made me stop and take notice and that was over a decade ago. I rarely get the chance to drink it but when I do it feels like a first kiss from an old lover. 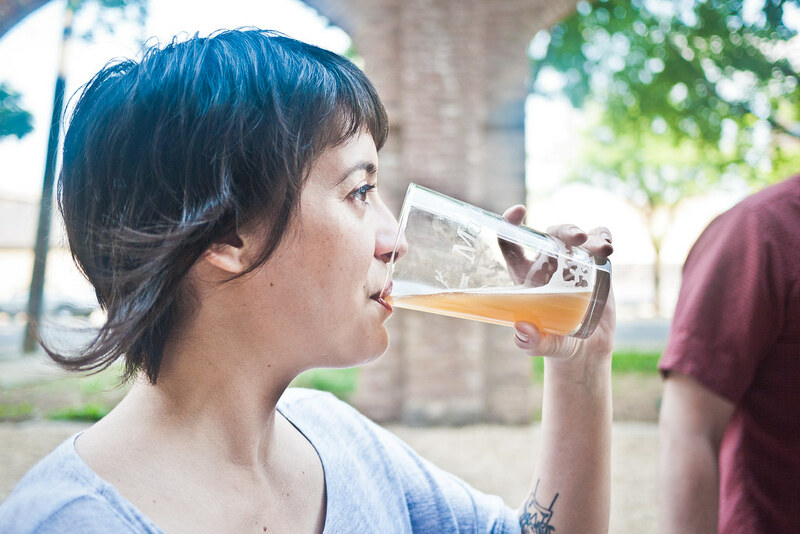 A recent memorable beer experience happened in Sacramento back in March. A good friend of mine took me to Pangaea Two Brews Cafe. The beer selection was unexpected, and the owner was so friendly, knowledgeable, and had great energy. He took the time to talk with us about the history of Belgian saison beers. We learned a lot and exchanged some great ideas. I really enjoyed that moment because I realized that beer is usually secondary for me. What matters most is the people I’m surrounded by and the conversations that we have. If I’m inspired by both the beer and the person, that moment will stick in my head for awhile. I live in Logan Square and am lucky to live near many excellent bars and have an affinity for all of them and their fine bartenders. However, I’d say my favorite bartender is my neighbor across the hall. He makes an outstanding Manhattan, is an active listener, and dispenses sage advice. He helps me keep my head on straight. When I’m not having a situational crisis, we trade recipe ideas for Bloody Marys and bacon-infused vodka cocktails. Haven’t had that epic hunt yet, but I did go to Mash Tun Craft Beer festival in Bridgeport on Saturday and was blown away by some stuff I tried: Half Acre Meatwave, St Feuillien Speciale, Firestone Walker Wookey Jack, Virtue Cider Redstreak, and Pipeworks Saison. Pipeworks Saison! It was so delicious and ran out so fast at Mash Tun. Can’t wait to get my hands on some more.